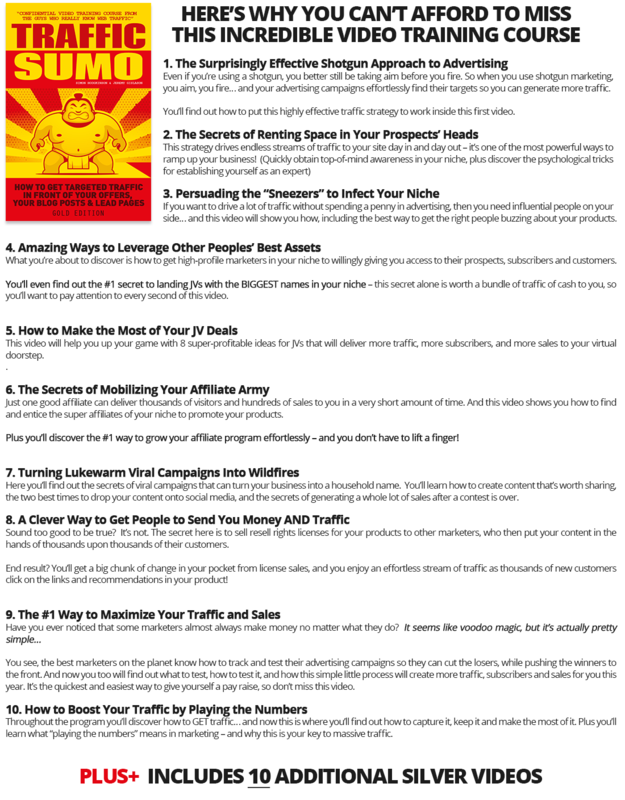 "Discover The Smart Way To Grab Attention, Engage Your Visitors To Drive More Traffic, Boost Clicks and Increase Sales & Profits!" 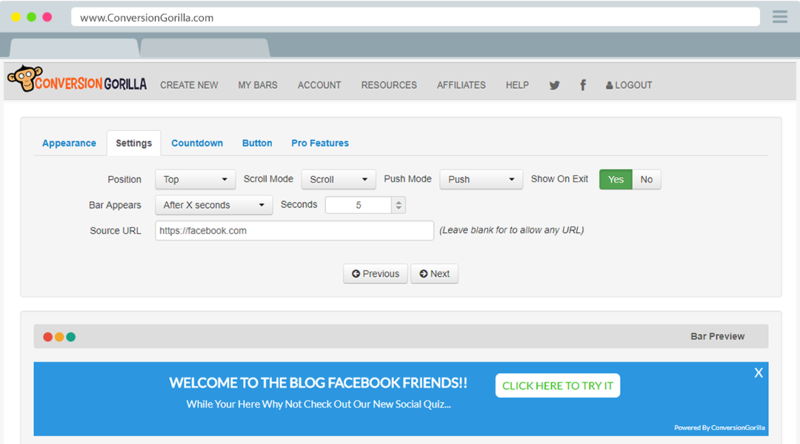 You can then easily add the bar to your page(s) by just adding a single snippet of code. Each timer can be customized further and you'll have a wealth of extra features "under the hood" to maximize your timer's impact. 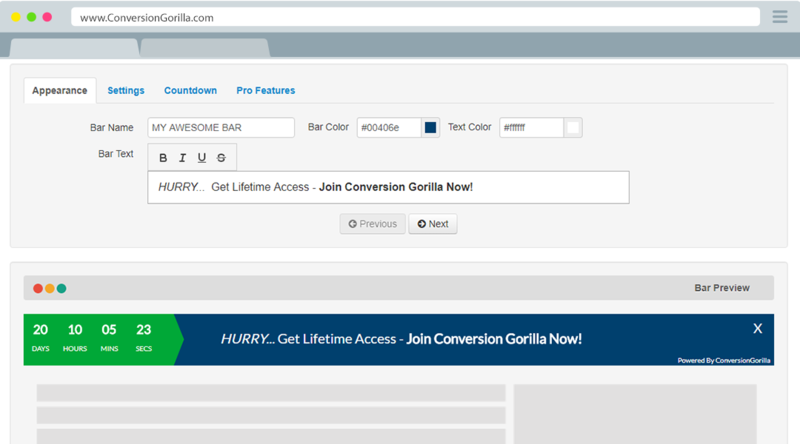 Choose Conversion Gorilla's Traffic Bars and add a fully customizable button to your bars. 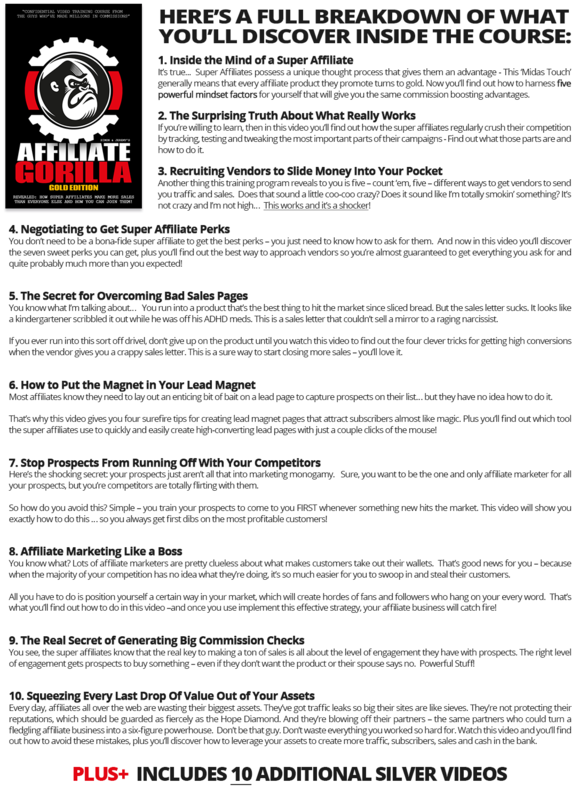 Drive visitors to new offers, other pages on your site, landing pages, affiliate offers and much more. These can also be combined with countdown timers for maximum click through rates and you'll be able to see your bar impressions and button clicks at a glance for all your bars right inside your dashboard. Create Awesome Looking Bars With Point & Click Customization Inside Your Dashboard. 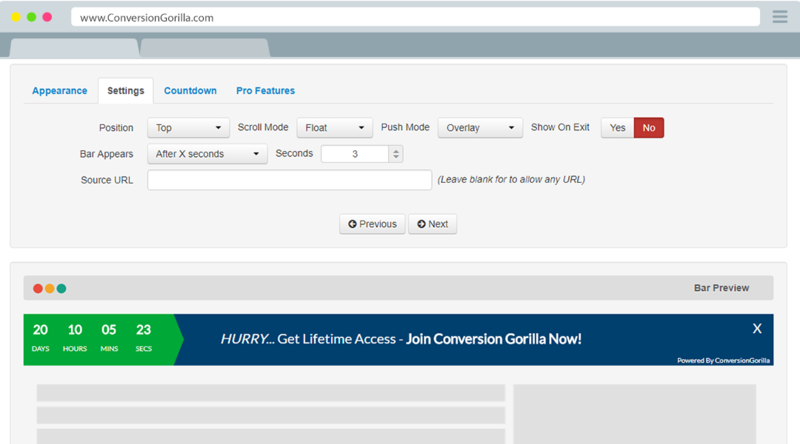 With Conversion Gorilla everything is simple and fast! Use the integrated wizard feature to create any kind of bar and configure it's settings in just minutes. Zero coding required. Creating A New Bar Takes Less Than 2 Minutes - It's Easy To Do! 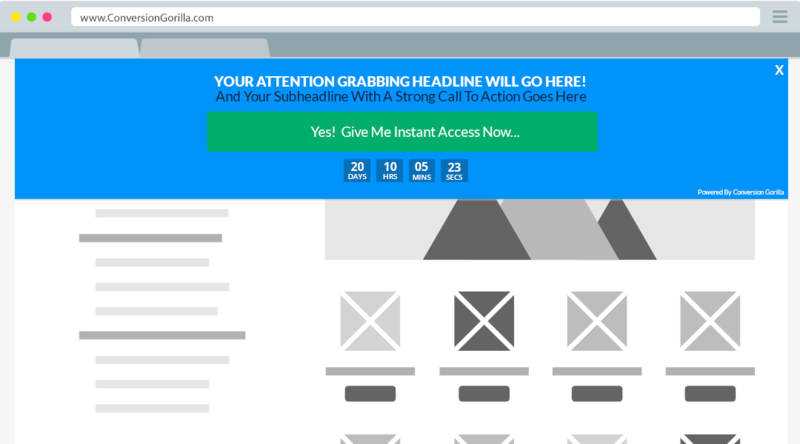 You can include a headline or message along with a secondary call to action text line making them a great option for Traffic Bars, promoting affiliate offers and much more. Position bars at either the top or bottom of your pages. 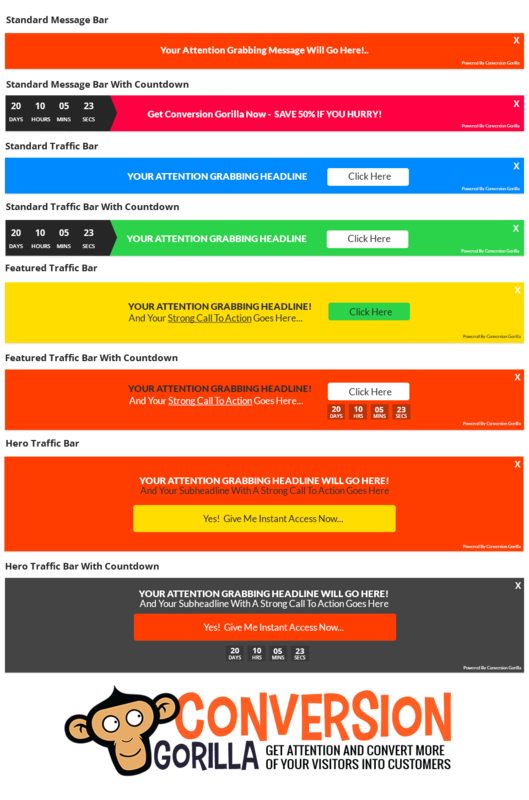 Choose if your bars should sit at the top of your page and push down the page content or have it float/scroll above your page's content staying in the visitor's eyeline at all times. 10 Reasons To Say 'YES' Right Now! Easy To Use Wizard - Build In 2 Minutes! 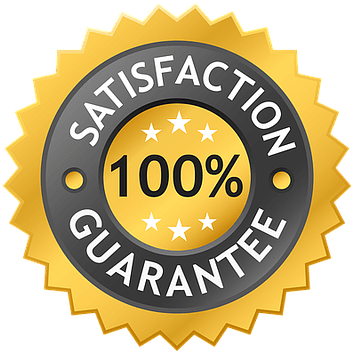 In fact we're so confident that you will absolutely love Conversion Gorilla but just in case there's the remotest possibility you don't agree, then we are offering a 30-Day, no questions asked, no hoops to jump through same day money-back guarantee... So Why Not Get Started Today! Try it Risk Free for 30 Days ... Hurry Act Now! 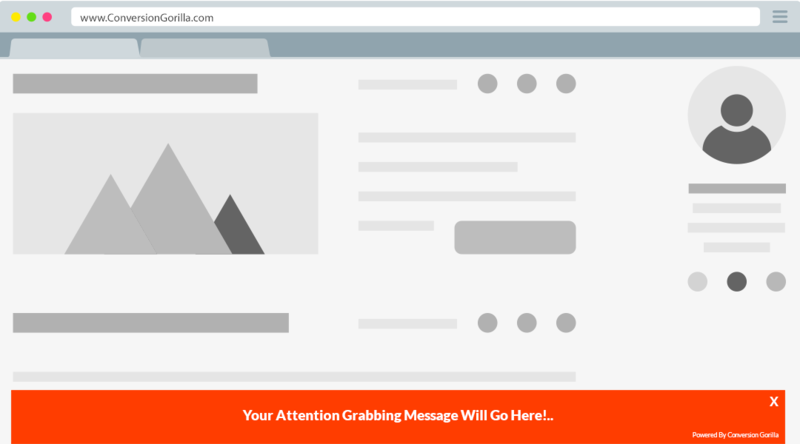 CLICK HERE NOW TO START GRABBING MORE ATTENTION! How Many Sites Can I Put Conversion Gorilla On? 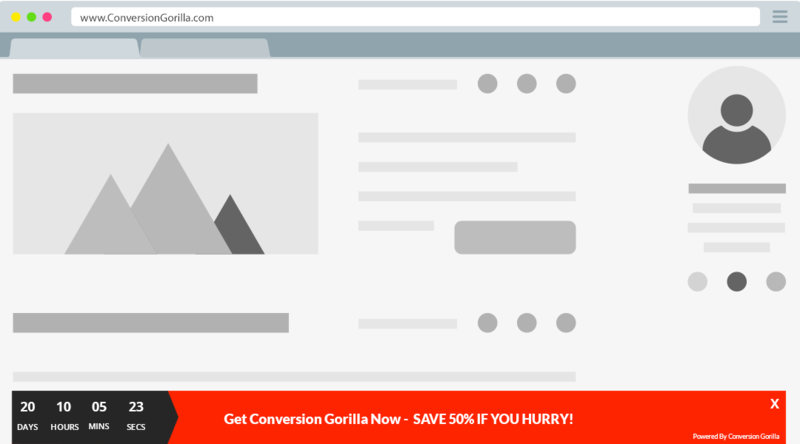 There are ZERO limitations, you can use Conversion Gorilla on an unlimited number of your personal sites. Each individual bar can be placed on multiple sites/pages at the same time. How Many Active Bars Can I Create? You can create up to 10 bars in your account that will be active at any one time. This includes ANY combination of attention bars and traffic bars. If you need more, we have an easy upgrade option to go 'Unlimited' during your account creation process. Of course – if you’re not happy with Conversion Gorilla, we don’t want your money. You get 30 days to try out the platform. If you’re not satisfied, just let us know and we’ll send you a refund. Do You Offer Any Help or Support? Yes we do! Our friendly support team will be happy to help you via our support desk or email anytime you need to get in touch. We also have detailed, product and set up Q&A area with training you can refer to at anytime. What's With This Crazy Low Price? You're clearly someone with their finger on the pulse because you've found us at exactly the right time! Right now we're rapidly growing our user base - And we've put together a great value deal to welcome folks onboard. As a result you get to join us today with a deeply discounted account. How do I get the bars working on my site(s)? You simply copy a little code snippet that you get from your Conversion Gorilla dashboard and paste it into the webpage's code. We also recommend a FREE WordPress plugin you can use on your blog that can add the snippet to multiple pages, posts, categories and more all at the same time. Can I Use Bars To Collect Emails? Yes You Can! It's not a standard feature but we do offer an 'add-on' that turns regular bars into powerful 2-step lead capture bars - They work great. 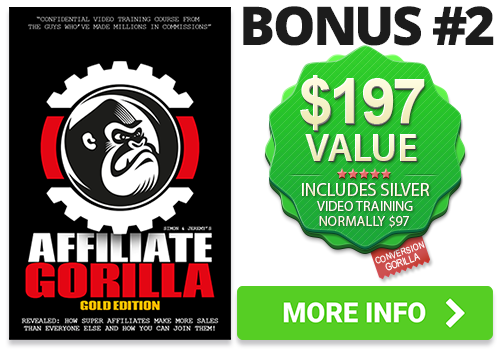 Make sure to check out the offer once you've picked up Conversion Gorilla here. Can I use bars for social media campaigns? Yes You Can! 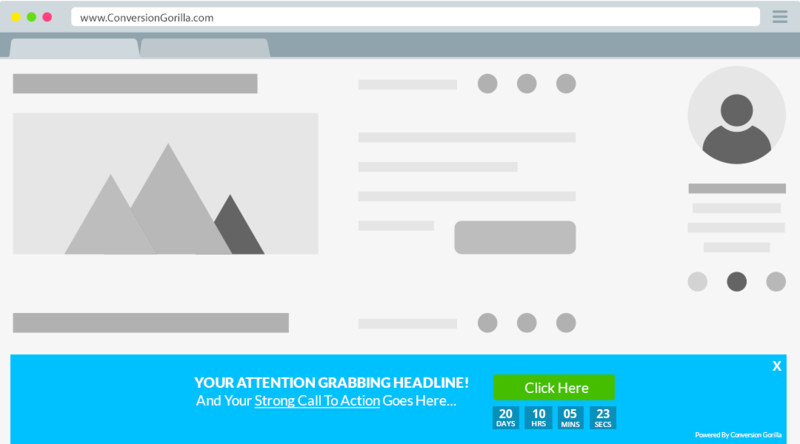 Like email collecting bars, social media bars to collect likes, follows, shares and even click to call via Skype are available via a low cost 'add-on' option you'll see once you've picked up Conversion Gorilla from this page. 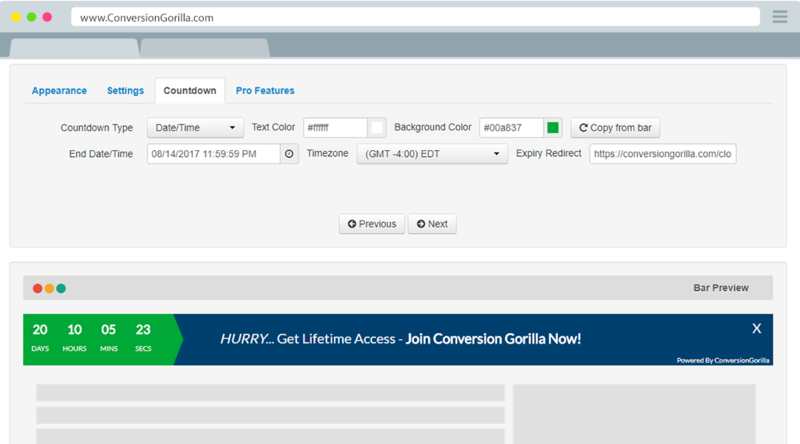 CONVERSION GORILLA SOFTWARE IS FOR PERSONAL/COMMERCIAL USE ONLY. IT CAN BE USED IN CONJUNCTION WITH ALL THE WEBSITES YOU/YOUR COMPANY OWNS. IT CANNOT BE USED ON BEHALF OF A 3RD PARTY, INCLUDING CLIENTS AND/OR CUSTOMERS. IF YOU HAVE CLIENTS WHO WOULD BENEFIT FROM OUR SOFTWARE WE SUGGEST YOU RECOMMEND IT TO THEM AND ASK THEM TO CREATE THEIR OWN ACCOUNT THAT YOU CAN MANAGE FOR THEM OR PURCHASE AN AGENCY LICENSE FROM WITHIN YOUR ACCOUNT DASHBOARD. ANYONE FOUND USING THEIR ACCOUNT IN BREACH OF THIS POLICY WILL FORFEIT THEIR ACCOUNT.